We work tirelessly to provide you with the freshest fish & seafood available on the market prepared by hand to individual exacting requirements, delivered direct to your business in one of our own clean, modern referigerated vehicles and at competitive prices with our exceptional quality and superior attention to detail. Our service is unique and we believe it to be second to none. When you deal with us you are dealing with a 100% family owned and run business, where our number one priority is the satisfaction of our customers. All our fresh fish is natural and pure we do not use any chemical agents or weight bulking processes. To see a description of the process of our fresh fish from boat to plate click here We can Deliver to Virtually any U.K Business address with no minimum order amount! Contact us to find out more. Every fish that enters our factory can be traced right back along the line, from the port it was landed, to the boat that caught it and where it was caught. The majority of the fish boxes containing whole fish bought at market will contain a 'tally' with the boats name and weight of fish in the box. If you would like to know where your fish was caught or who caught your fish and the name of the boat, we can provide you with all of the necessary information. Provenece is key. Sustainability is a word much misused in the selling of fish, there is no definitive guide but our take on it is quite straightforward. We buy fresh fish from fishermen who are passionate about their job and have in place many methods which try to conserve both fish stocks and the environment in which they fish. Sustainability is about responsibility and the fishermen themselves having good management practices to safeguard the future of their own job, which most do and most are interested in. 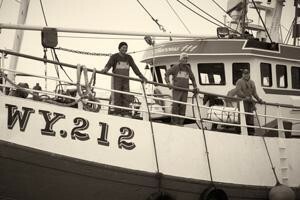 Much of the work our British fishermen do is unseen and not publicised. Here at Dennis Crooks we are conscious of sourcing fresh fish & seafood from responsibly managed stocks and from responsible fishermen, we work closely together with many of the skippers around our shoreline that are forward thinking and actively conserving fish stocks through their own conservation methods. To further our commitment to the sustainability of our seas we are now an MSC certified sustainable seafood supplier, The MSC chain of custody is recognised world wide as the the gold standard for sustainable fish & seafood. Visit the Marine Stewardship council's website here for more information on what 'The MSC' is all about.